I've not seen this posted here. A QLED tv under 1k seems a good deal. Please......if you spending this much on a tv, do not rely on how good the picture looks in Currys, its a useless comparison. Some TVs are well calibrated out of the box, some aren't, and they invariably have a "retail" setting that over sharpens and over saturates. Currys will never (rarely) spend time setting the TVs up properly on anything but the top of the range ones..
An LG B7 caught my eye in Currys the other day. It had a Dolby Vision / HDR test on/off loop running. Needless to say it was the "on" setting that caught my eye. (It also stated it was Atmos on/off on the lopp, lol, it was a silent TV, and one of the Currys guys was actually trying to tell a customer that Atmos affected the picture). However the more I looked at it the more I thought how unnatural the colors looked, and would be tiring to watch at home. HDR isn't about bright vivacious colours its about detail in the colours, eg clouds in a blue sky will show a variety of whites and greys rather than a mush of light grey. Ignore What hifi reviews, their top advertisers get the best reviews. Look at web sites like AV Forums for decent reviews. Once you have your TV, spend 30 mins and download the 'HDMV' file (HDMV-2d Calibration.iso) from here avsforum.com/for…tml, and follow the simple instructions here lifehacker.com/585…ess. Even better pay to get it professionally calibrated, but even doing it DIY will make a huge difference. I was sorry to read that you experienced poor service during a warranty claim. So that I may investigate further and resolve the matter to your satisfaction please could you drop me a PM with your contact details? Once again, I offer my apologies, I look forward to hearing from you soon. code still works. £949 here. Cold for me. You can can only buy the one on Samsung list, and they are double the price of CB offered. Exactly the Mu7000 is £799. In 4 years time tech would have moved on and wallpaper ones would be sub £2000. I would rather save my £200 for then. Currys have matched this. Put it OP. Save someone posting a separate deal. Why are Qled dropping in price so fast? Samsung introducing micro LED TV’s next year. Which is better than OLED apparently. This is the new budget version. I guess Samsung just reducing the prices to beat Oled in the “ War of the Panels’’. Was looking at them in curry’s also. For ref there is a separate box/hub that you connect all your cables into. It’s so ugly, they could have made it look better. As for picture it looked pretty good and bright. I Purcahsed the Samsung QE49Q7F @ the weekend...saw this one & is def a poor substitute. There is no comparison when you compare the picture. They're not compared to Samsung last year's Samsung models. Some were £500 cheaper this time last year. Was looking at them in curry’s also. For ref there is a separate box/hub t …Was looking at them in curry’s also. For ref there is a separate box/hub that you connect all your cables into. It’s so ugly, they could have made it look better.As for picture it looked pretty good and bright. I think that's the idea, you hide it away and connect all cables into it so they are not on show. I Purcahsed the Samsung QE49Q7F @ the weekend...saw this one & is def a …I Purcahsed the Samsung QE49Q7F @ the weekend...saw this one & is def a poor substitute. There is no comparison when you compare the picture. Yes there is. You can hardly tell the difference. And it's 55 instead of 49. Because I can get 20 percent off at Currys. 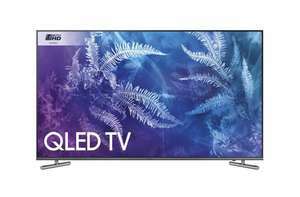 …https://www.hotukdeals.com/deals/samsung-qe55q6fam-55-qled-ultra-hd-premium-hdr-1000-smart-tv-94905-with-code-prcdirect-2837222code still works. £949 here. Cold for me. Long story, in short, I get 20 percent off at a different store as family works for them. That 20 percent includes gift cards, so I can get gift cards for Currys but not richer sounds. According to DS the mu7000 is 8+frc, not native 10. Long story, in short, I get 20 percent off at a different store as family …Long story, in short, I get 20 percent off at a different store as family works for them. That 20 percent includes gift cards, so I can get gift cards for Currys but not richer sounds. It doesn't matter what it is, very few people are going to be feeding 10-bit SDR signals to the TV and HDR works differently. Why wouldn't they? They've been high all year and are still more expensive than they were last year. I think the KS7000 was down to £900 by this point. No, they're showing a prototype at a trade show which is quite a different thing. It'll be interesting to see how much it's refined over the currently available implementations of ~0.86mm pixel pitch LED displays. Ultimately it's just a tech demo to grab attention rather than a product close to release. 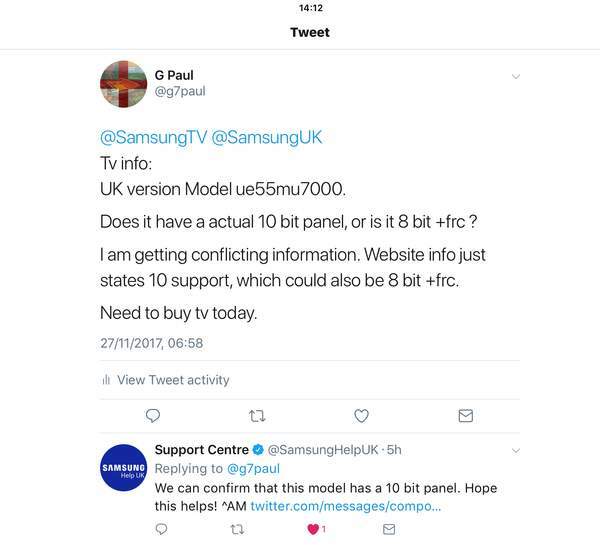 Samsung aren't going to launch 75" Full HD and 50" 1280x720 screens after all the hype they've put into 4K and all the rubbishing they've done of LG's panels for supposedly not having enough resolution. If anyone takes a gamble on those, and I hope they do, then it'll be a small company looking to break into the TV market. Please......if you spending this much on a tv, do not rely on how good the …Please......if you spending this much on a tv, do not rely on how good the picture looks in Currys, its a useless comparison. Some TVs are well calibrated out of the box, some aren't, and they invariably have a "retail" setting that over sharpens and over saturates. Currys will never (rarely) spend time setting the TVs up properly on anything but the top of the range ones..An LG B7 caught my eye in Currys the other day. It had a Dolby Vision / HDR test on/off loop running. Needless to say it was the "on" setting that caught my eye. (It also stated it was Atmos on/off on the lopp, lol, it was a silent TV, and one of the Currys guys was actually trying to tell a customer that Atmos affected the picture). However the more I looked at it the more I thought how unnatural the colors looked, and would be tiring to watch at home. HDR isn't about bright vivacious colours its about detail in the colours, eg clouds in a blue sky will show a variety of whites and greys rather than a mush of light grey.Ignore What hifi reviews, their top advertisers get the best reviews. Look at web sites like AV Forums for decent reviews.Once you have your TV, spend 30 mins and download the 'HDMV' file (HDMV-2d Calibration.iso) from here http://www.avsforum.com/forum/139-displa...ation.html, and follow the simple instructions here https://lifehacker.com/5858625/how-to-ca...es-or-less. Even better pay to get it professionally calibrated, but even doing it DIY will make a huge difference. So at this price mark, what TV would you recommend. This one? Sorry, no idea. I haven't bought a new TV for a couple of years, and won't until OLED comes down in price and HDR & Dolby Vision implementation is properly sorted. Honestly, I don't mean any disrespect to those on HUK who are knowledgeable AND objective, but this isn't really the place to get an objective opinion. Like I said, try AV Forums, lots of good reviews by knowledgeable people, and if you ask in the TV forum you will more than likely get good advice. Too many people here, who will tell you buy what they have bought. I did a search fort the model number before posting and nothing came up, sorry. Sony XE9005. Thats what im waiting on. But its not at this price....yet. Deal posting newbie! This is costco first deal post. Help out by leaving a posting tip or just to show your appreciation for their contribution.